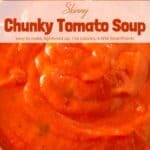 This simple skinny chunky tomato soup is a snap to prepare. I love from scratch tomato soups but sometimes they take more time and effort than I have to give. That’s where “doctored up” low fat tomato soup comes in. This recipe is definitely not for purists who would never dream of stocking a few cans of condensed soup in their pristine pantries. The addition of canned diced tomatoes and tomato juice make it much more interesting than plain ol’ canned tomato soup. It was surprisingly well received when I served it with lightened up BLTs for supper last night. This tomato soup is a great option when you need a light lunch or supper in a snap. According to my calculations, each serving has about 156 calories, *4 Weight Watchers PointsPlus, *6 WW Freestyle SmartPoints. Enjoy! Are You Ready To Slim Down With Soup? Curious about Weight Watchers Freestyle/Flex plan? If you’ve made this simple 15-Minute Tomato Soup, please give the recipe a star rating below and leave a comment letting me know how you liked it. And stay in touch on Pinterest, Facebook, Instagram and Twitter for the latest updates. 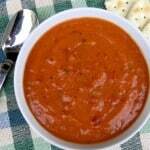 A super simple tomato soup stirred together from common pantry staples. 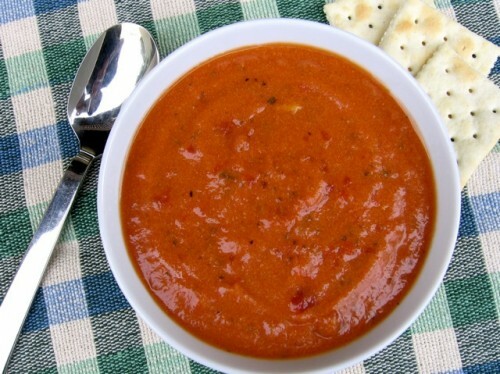 In a medium-size saucepan, combine the tomato soup, tomatoes, milk, tomato juice and spices. Bring to a boil over medium heat, stirring occasionally, then lower the heat and simmer for 4 to 5 minutes. I used 1/2 teaspoon Thai red curry spice rub to give the soup the most subtle bit of barely detectable heat. You could use your favorite Thai red curry paste instead or add a bit of cayenne.